Remember these? If you understand the concept , you can design the perfect TV stand or choose from a variety of sample TV stands and TV cabinet configurations priced out and ready to order. 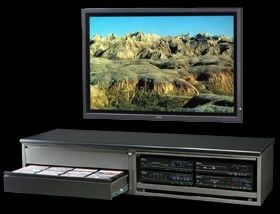 You can even have it on wheels or legs so you can set the exact viewing height of your TV. Whatever your TV, Can-Am has the stand for you...for	now, and forever! Choose Can-Am modular cabinets to make your dream TV stand a reality. It couldn't be any simpler. All Can-Am cabinets come fully assembled - no tools or assembly is required. Your dream entertainment center is just a click away. The COM2D20 above and the COM2D27 opposite will hold 240 DVDs or Blu-ray, as well as your electronics. Get them with wheels and you've got it all. 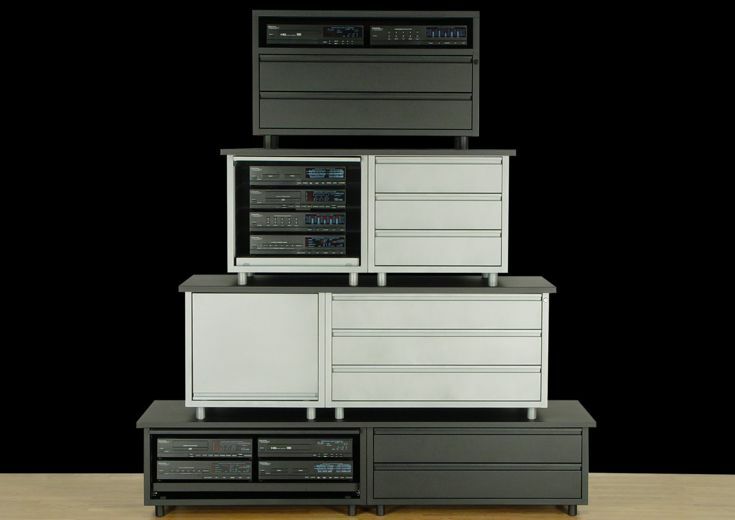 A serious contemporary TV stand ready to grow into your dream AV center. Your TV may not require a stand, but a cabinet below can set it off and provide a home for all your components, CDs & DVDs. What's TV without movies anyway? How does 150 Blu-ray per drawer sound? What If I Change My TV? It's not a matter of if, it's really a matter of when. When you do, Can-Am modules reconfigure easily. How many TV cabinets are in landfills because they couldn't evolve? It's time to invest in your very last TV stand. That's good news for you and the environment. Your CD and DVD library will grow, and eventually you will change your TV. That's OK, because you can always reconfigure or add modules to handle whatever the future has in store. You know Can-Am is the place for your DVDs but we also accomodate all the electronics and accessories. Game on! Design your game center in any of eighteen colors to match any theme. speak with an AV designer.